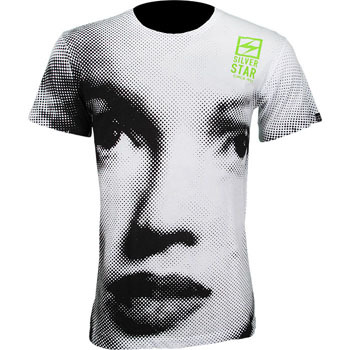 Is that Marilyn Monroe on a Silver Star shirt? Yes it is. Check out the Silver Star Untitled T-Shirt! Silver Star Casting Company definitely taking a leap here, featuring arguably one of the most famous personalities of our lifetime, Marilyn Monroe. Monroe on an MMA shirt though? Pretty odd and cool at the same time. I personally just placed an order for the Silver Star Untitled T-Shirt as it’s one of the most unique Silver Star shirts out in the market today. The Silver Star Untitled T-Shirt is a 100% cotton, athletic fit shirt so order a size up for a looser fit. The Silver Star Untitled Shirt is available at MMAWarehouse.